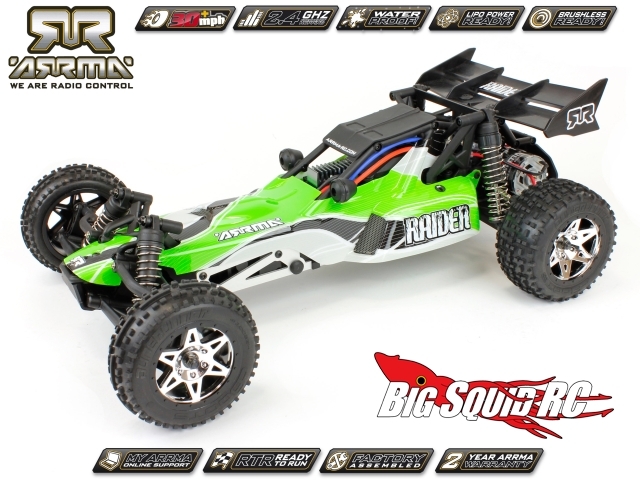 ARRMA Raider 1/10 Scale 2WD Baja Buggy « Big Squid RC – RC Car and Truck News, Reviews, Videos, and More! 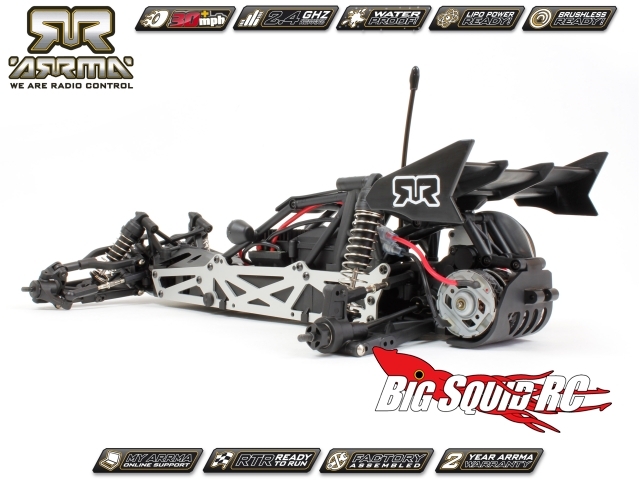 It’s time to check out some of the hardware ARRMA is going to be bringing to the table. 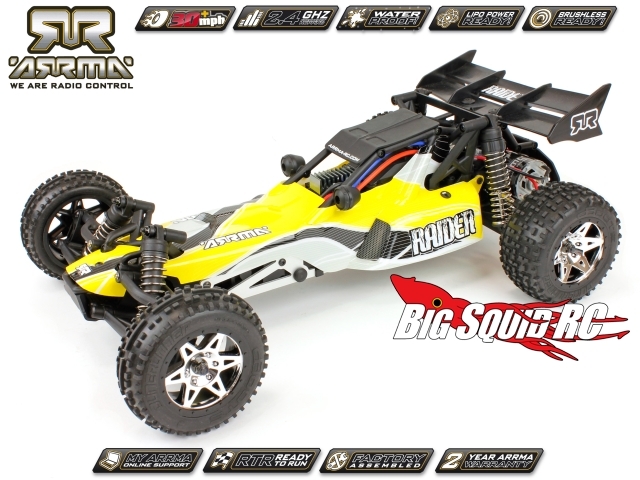 First up is the Raider 1/10 Scale 2WD Baja Buggy. The first things that catch my eye are the TVP (twin vertical plate) aluminum and molded composite chassis, all metal transmission, fluid-filled differential, and waterproof electronics. Wait… Waterproof electronics?! These guys must have read our rants about that or something! That’s awesome! The Raider will ship with a 15T brushed motor, and they advertise as “lipo power ready”. 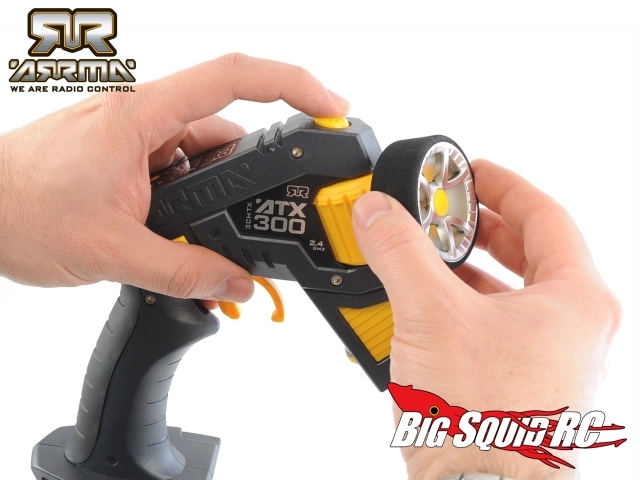 A 2.4GHz radio and receiver setup comes standard, but features a hot-swapable steering wheel to quickly adjust the wheel angle and go from right to left handed at the press of a button! That’s…unique and pretty flippin’ cool! You can also open the battery tray without removing the body. Okay, I’m really starting to think they built these vehicles with us in mind. Steel drivetrain, and ALL HEX HARDWARE! Whoo hoo! All you’ll need to run is 4 AA batteries and one of their battery kits for the buggy (or any battery, really). This buggy look sick! I’m totally stoked now. It will be available in 4 colors, but I’m not sure on prices or actual shipping dates at this time. 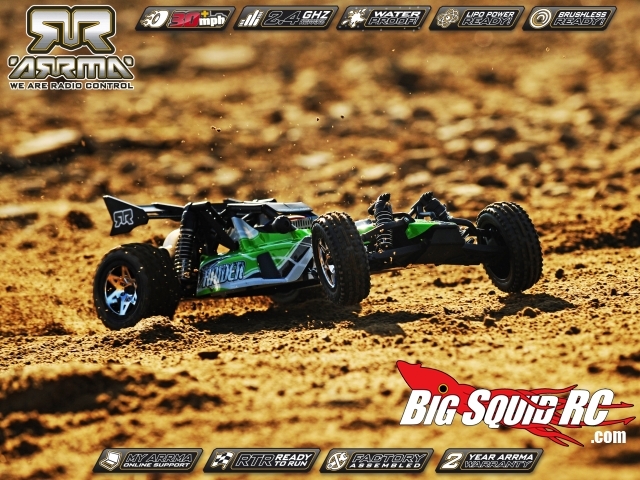 Trust me when I say that we’ll be reaching out to ARRMA to find out more, and do everything we can to get one of these bad boys in the office to see if it stacks up as the new ultimate basher! Make sure you check out their new website by clicking here! Hit the jump below to check out a video!